I just ran across this cover for Sarah Addison Allen's upcoming novel The Peach Keeper . I like it, particularly as I've been enjoying the lovely fresh peaches we've had this fall. It does bear a certain resemblance to Deanna Raybourn's recent Dark Road to Darjeeling cover and, as that cover was for that series, represents a departure from Allen's previous, more whimsical covers. In any event, I can't wait to read this one. Allen's books are literary soul food. 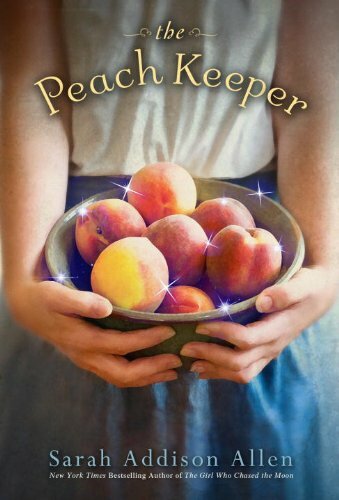 The Peach Keeper is due out March 22nd. I showed this to my Mom she was so excited about it! That cover is lovely! I really should start reading Sarah Addison Allen soon. You'll notice that at Amazon, the bowl of peaches has sparkles added all over it. There's your whimsy. Caitlin, I think you'd like her stuff as well. Glad your mom's all excited. I am, too! Chachic, you really should. I adore them. I will love any cover with sparkles on it. This is a gorgeous cover...except for the sparkles. I think its simplicity is beautiful enough without the sparkles. Oohhh! Seeing a cover makes it feel like that much closer to being published! 5 months of anticipation coming up! I still have to read something of this author, but her covers are always gorgeous! This one is no exception, despite some differences! Wonderful! Her writing is so magical. Sweet! I was just wondering the other day when she'd be putting out another novel! Thanks for the heads up! Oh this looks lovely! I just started reading SAA this year, and I love her stuff! So glad she's got another one coming out! So what did you think of the final cover?